WasteNoTime is a browser extension which is designed to help you manage your time spent on the Internet more efficiently. As seen on CNet, PCWorld, Forbes, and Wired! 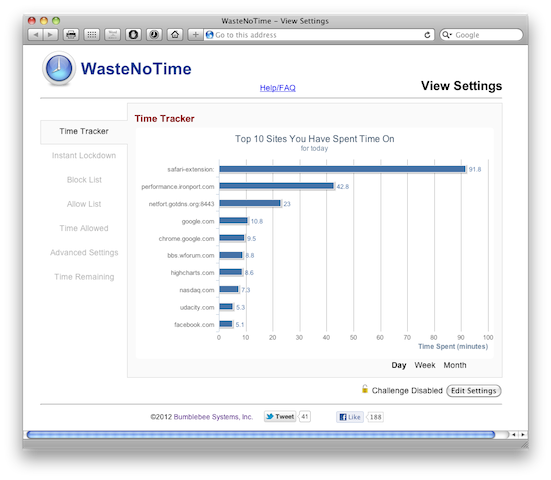 Time Tracker feature gives you reports on what web sites you spent most of your time. Instant Lockdown feature allows you to focus on your work for a period of time with limited Internet access. Time Quota feature automatically block selected web sites when you have spent a preset amount of time on them each day. WasteNoTime extension is now available both on Safari and on Chrome. You may share settings across multiple browsers or multiple computers. This project is inspired by James N. Anderson's LeechBlock Firefox extension. To download WasteNoTime Safari browser exension, click the link below. Then double-click the downloaded file to install it on Safari browser. WasteNoTime is also available in the official Apple Safari Extension Gallery and in Google Chrome Store. Bug fixes. Make it available via Safari Extension Gallery. Display an alert when InstantLockdown period is over. Allow any protocol string such as "chrome://" in URL patterns. One use case is that users can now block system page such as "chrome://extensions" to prevent WNT extension from being disabled. Adjusted idleness detection: Treat Chrome window being minimized or in background as idle. The black list can now be re-ordered by users which is necessary when you have per-site custom settings and want to control which pattern matches first. Added Time Tracker feature to report top sites in the past day, week, and month. Fixed an issue with Safari on Windows where challenge string is not displayed correctly. Added whitelist feature so users can use some cover-all blacklist and then unblock site-by-site. Changed timer behavior and timers now stop when the browser is minimized. Fixed issue that the WasteNoTime Settings button appears to be disabled on some Safari versions. Fixed issue that status bar is mistakenly displayed when it is disabled. Now users can disable the status bar using standard View menu. How do I use WasteNoTime Safari Extension? WasteNoTime extension adds an icon to Safari browser toolbar. Clicking it will display the WasteNoTime popover window, where you may check how much allowed time left, add sites to be block, and access Settings page. Safari Preferences...-> Extensions -> WasteNoTime -> Additional Options. Do you collect any information about my browsing history and habbits? Absolutely not. WasteNoTime extension simply tracks the amount of time that you spent on sites on the block list and it doesn't keep a record on what sites you have visited. No browsing history is transimitted off your computer. Where is WasteNoTime settings stored on the computer? WasteNoTime extension uses Safari browser HTML5 local storage to store settings. Current version sets the maximum allowable local storage to be 5 MB. How do I uninstall WasteNoTime extension? Go to Safari Menu/Preferences.... Click on the extensions tab. Choose the extension you want to uninstall. Click the Uninstall button. In Chrome, go to "chrome://extensions" page and click uninstall button next to WasteNoTime extension. How do I prevent WasteNoTime extension from being uninstalled or disabled? If someone is determined to remove an extension, he can always find a way to do that because WNT is a browser plugin which is designed to be easily removable. On Chrome, there is trick to make it harder to remove an extension. Add 'chrome://extensions' to the Block list and then click the customization icon to set the url to 'Always Block'. This way you won't be able to get to the 'chrome://extensions' page unless you can modify the WNT setting, which can be protected by a password. How do I know how much allowed time is remaining? Click the toolbar icon. In Safari 5.1 and later, it will display a popover window which shows how much time is remaining and the status of the web site that you are currently visiting. In preious Safari versions, it will open View Settings page in browser window and the "Time Remaining" tab displays how much time is remaining. If you enables WasteNoTime status bar, the time remaing is readily displayed there and updated in real-time. When do I need to use time ranges? By default, you simply set the time allowed per day. But sometimes you may want to relax it a little bit in the evening or in lunch break. WasteNoTime extension allows you to set two separate timers, one for within work hours and one for outside work hours. You use time ranges to define what is considered as work hours. How do I define work hours? If you have simple 8-to-5 work schedule, you may get away by defining only one time range: from 8:00AM to 5:00PM. If you allow yourself a lunch break, you may use two time ranges, for example, from 8:00AM to 12:00PM and from 1:00PM to 5:00PM. You can use as many time ranges as you want to define work hours. What happens when Allowed Time is running out? When you have reached the maximum time allowed, access to sites on the block list will be denied and the preconfigured block page will be shown instead. After midnight, all timers are reset and start counting again. How do I add sites to be blocked? You have multiple ways to add blocked sites. In Blocked Sites section, you may enter multiple sites at the same time, one per line. You may also add blocked sites using context menu while you are browsing. Preceding http:// can be ommited if you don't want to be protocol specific. Can you give some examples on the URL patterns that I can use to add blocked sites? foo.com/path matches any url under "foo.com/path", such as foo.com/path, foo.com/path/xyz, but it doesn't match foo.com/pathxyz. */search?q=cache: matches any url that has path "search" and query string starting with "q=cache:". It effectively matches Google cache URLs. I really want to concentrate on work. How do I block ALL sites? Just add * to your block list. Or you may try the Instant Lock-down feature. Does the timer continues when the browser is minimized or stays in the background? When the browser is minimized the timer is stopped. Also if the extension detects that the user has been idle for a while (by default 30 minutes which is configurable in Advanced Settings), the timer will temporarily be stopped until the user comes back. WasteNoTime considers the user is idle when the browser is put to background or the user leaves the desk. Note: Prior to release 2.1.3, if the active window of the browser is on a site on the block list, the timer will continue to run even when the browser is minimized or stays in the background. You have to navigate away from the page to stop the timer. How do I configure custom time limit for specific sites? First, you need to add the site to Block List. On Edit Settings page and Block List tab, you may click the site which would bring up a dialog box with a number of options including "Always Block" and "Custom Time Limit", where you may set the time limit for this web site only. Notice that, for sites with custom time limit, the global time limit still applies. When either of them is used up, the site will be blocked. I forgot the password that I set and now I can't change the settings or modify the block list. What can I do to recover the password? Well, you can't recover your password but you can reset the settings to factory default and then you can have access to the settings. Go to your home directory and then subdirectory Library/Safari/LocalStorage. Find a file starting with "safari-extension_com.bumblebee.wastenotime-...". Remove that file and restart Safari, then you should have factory settings. How do I share the settings between Safari and Google Chrome? You may export the settings from one browser to a file and then import the file to another browser. Edit Settings -> Import/Export -> click "Export Current Settings" button. Keep note on the location of the exported file wastenotime-settings.json which is normally in the Download folder. In the second browser, Edit Settings -> Import/Export -> Select the file to import and then click "Import Settings". Remember to Apply Settings in the end. What if I have more questions? And how do I report bugs? You may reach us through email, twitter or Facebook. Please see Feedback page for details. If you have any question or suggestion, please feel free to drop us a message on , find us on Facebook , or report to us via Chrome Web Store. If you find WasteNoTime browser extension useful to you, please donate $10 to support the ongoing development work.